Standing from left to right are Gallia County Commissioner David Smith, Commissioner Brent Saunders, Guiding Hand Honor Student Chelsea Mullins, Gallia Boad of Developmental Disabilities Superintendent Pamela Combs, Guiding Hand Honor Student Malachi Markin and Commissioner Harold Montgomery. The commissioners proclaimed March Developmental Abilities Awareness Month Thursday. 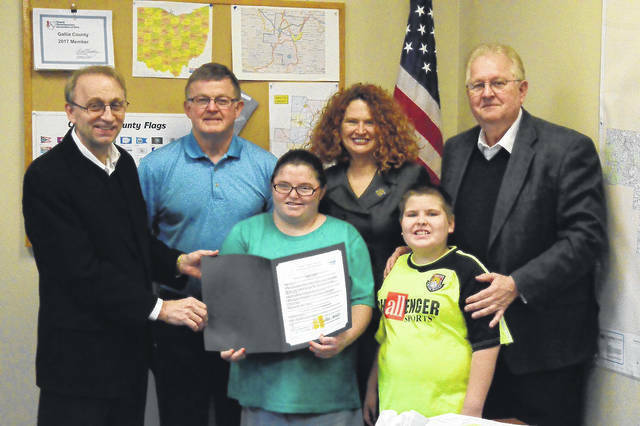 GALLIPOLIS — Gallia Board of Developmental Disabilities Superintendent Pamela Combs visited with a pair of students to the Gallia Board of Commissioners Thursday during its regular meeting to discuss Developmental Disabilities Awareness Month and what the Board of DD was doing in Gallia. After the commissioners proclaimed March Developmental Disabilities Awareness Month, they traveled to Guiding Hand School to share a meal with the school administration and discuss what what the Gallia Board of Developmental Disabilities was planning for the coming year. Last year, PALS Chrysalis took over the Gallco program. Gallia residents also voted to approve a new levy for individuals with developmental disabilities programs. With 2.8 mills of funding, Combs expressed gratitude to the community as the additional funding would allow the Guiding Hand School to remain open and the board to increase and maintain services. With the recent announcement and impending closure of Middleton Estates, an intensive care facility, the board is moving to purchases homes in the county to assist with the care and community integration of clients moving from the facility. According to Combs, roughly 30 individuals will be leaving the facility and most of them will be staying in Gallia. Those who wish to live in a house residence may. One home will be limited to a total of two clients, with the homes managed by a nonprofit entity. The board superintendent said this is to promote less provider traffic in a neighborhood and to give clients a stronger feeling of independence and belonging in a community. Clients will still have access to care but not belong to a group home setting. Combs said homes are being purchased with special funding through the Ohio Department of Developmental Disabilities and she expects no local dollars to be tied into the initiative. The board aims to purchase roughly 10 homes with around a million dollars of revenue being dumped into the local real estate economy over the course of the purchases. Combs said she and her colleagues are moving to make this happen as soon as possible.